The Saachi 2 in 1 Snack Maker, NL-2M-1545, is a great addition to your household appliances. Whether you’re entertaining guests, catering to children or simply looking to make snacks for movie night, this appliance is the one for you. 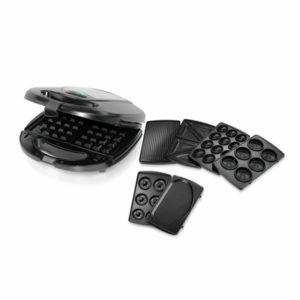 The non-stick, detachable plates allow you to make donuts and waffles to indulge your every craving. The Saachi 5 in 1 Snack Maker, NL-5M-1530, is a great addition to your household appliances. Whether you’re entertaining guests, catering to children or simply looking to make snacks for movie night, this appliance is the one for you. 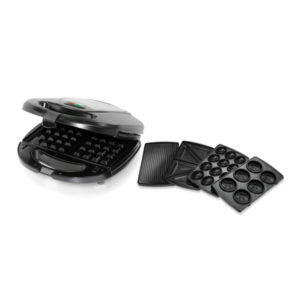 The non-stick, detachable plates allow you to make sandwiches, waffles, biscuits, nutties or a number of grilled items to indulge your every craving. The Saachi 5 in 1 Snack Maker, NL-5M-1535, is a great addition to your household appliances. Whether you’re entertaining guests, catering to children or simply looking to make snacks for movie night, this appliance is the one for you. 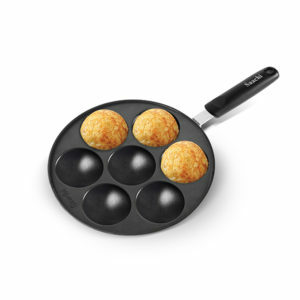 The non-stick, detachable plates allow you to make sandwiches, donuts, biscuits, nutties or a number of grilled items to indulge your every craving. The Saachi 7 in 1 Snack Maker, NL-7M-1533, is a great addition to your household appliances. Whether you’re entertaining guests, catering to children or simply looking to make snacks for movie night, this appliance is the one for you. 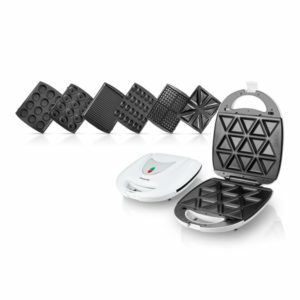 The non-stick, detachable plates allow you to make omelets, sandwiches, waffles, donuts, biscuits, nutties or a number of grilled items to indulge your every craving. The Saachi 7 in 1 Snack Maker, NL-7M-1542, is a great addition to your household appliances. Whether you’re entertaining guests, catering to children or simply looking to make snacks for movie night, this appliance is the one for you. The non-stick, detachable plates allow you to make samosas, sandwiches, waffles, donuts, biscuits, nutties or a number of grilled items to indulge your every craving. Turn your favorite fruits into frozen yogurt for healthy lifestyle.